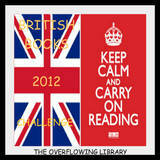 Welcome to the seventh month of the British Books Challenge. Please link your reviews below. Hope you got the email. Only one review from me this month. I'm going on vacation next week and I'll read the Eragon series there. I have to read the final book! I've reviewed 24 British books this year! Yay! I'm so pleased! I don't think I'd be aware of how many without the challenge, so thank you. Just linked two reviews for this month :) I should be posting another later, too. Done 13 this month and still need to write 3 more reviews! Nominate your favourite UKYA reads!